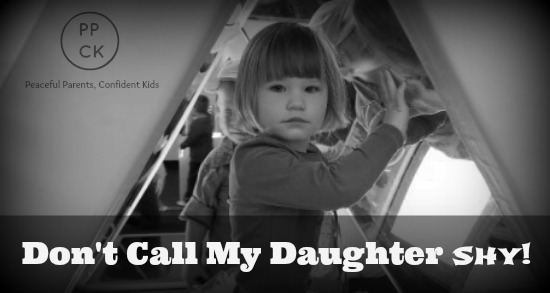 Don't Call My Daughter Shy! Shyness is something that has followed me around since my early childhood. I remember vividly hiding behind my mother’s legs during greetings and had a really hard time of it during Kindy, Pre-school and most of Year 1 at school where I would freeze up at every occasion I was confronted by a teacher or classmate. In my latter school years, public speaking requirements held me back from taking on leadership opportunities. I always felt so self-conscious, and would convince myself that people were judging me. The only time I was comfortable was when interacting with a small, close group of friends. In these situations, I was far from shy and in fact more like a leader and instigator of the activities we undertook. However, as a child, I remember people saying to me things such as, “Are you being shy?” or, “C’mon, don’t be shy!” when I couldn’t bring myself to respond to their greetings. I also remember being spoken about: “She’s just shy.” etc when someone would ask me a question and I would keep my eyes staring firmly at the ground. As I grew, I could never shake this label. Inside me was someone really wanting to talk to the world, to tell everyone about all my great ideas, to give them my opinion on topics. but I just couldn’t. I longed for the confidence to be able to speak openly in front of new people and to free my inhibitions. But I couldn’t. I was the shy one. I had heard this enough over my childhood from friends, family and teachers and I believed it. It’s what people expected from me and I felt stuck in that mould for a long time. The time in my life, I felt the most confident and able to be who I wanted to be was when I moved overseas for two years. I was able to build my life from scratch around people who knew nothing of my past. I was free to be able to recreate myself without any old labels getting in the way. So why am I telling you all this. Well, for some time my child (well both my children really but especially noticeable in my 2.5 year old, Lucy) has exhibited many of the same shy traits I possessed at her age. She, like many children, finds it difficult to respond to greetings not just from strangers, but even close friends and family. She seizes up in group discussions at her daycare centre when it is her turn to contribute and cannot bring herself to utter a word during phone calls even when she has requested they be made in the first place. Luckily, I discovered RIE (a form of respectful parenting founded by Magda Gerber) fairly early on and have been able to reflect on many of my parenting practices, to ensure that I am able to treat my children respectfully and sensitively. In doing so I resolved to cease using the ‘shy’ label on my kids. Whilst I have absolutely no problems with them being shy if that is something within their personality, I am really conscious that I don’t want them to feel that this is their lot in life. That this is how they always have to be if this is in fact just a stage. It is extremely common for children to exhibit shy tendencies. It doesn’t necessarily mean that the child is shy. Shyness in children is considered a developmental trait and can be attributed to immature social skills and a lack of experience in dealing with social situations. Coupled with another developmental stage known as separation anxiety, as well as unrefined verbal skills it is not surprising that my children aren’t running out of my arms to greet others and tell them all about their day. For one in five children, the maturation of social and verbal skills as well as a decrease in separation anxiety leads to a reduction in the effects of shyness over time. This is all the more reason not to plaster a child with a label that they may learn to internalise and make a self-fulfilling prophecy. I realise that many people who use the ‘shy’ excuse for their children are well-meaning and probably not aware of the potential effects of such comments. It is a way of creating a socially acceptable excuse for their child being impolite and not replying when someone speaks to them. As adults brought up in a society full of social expectations, it can be difficult to stand proud with a child who won’t look up when being spoken to, won’t say thank you when offered a treat or won’t say hello or goodbye when someone has explicitly spoken to them. So we duck for cover, find a good reason for our child’s bad manners and in doing so ensure we aren’t deemed as bad parents with impolite kids. At first I was a little perplexed as to why she would be saying this and then a few things occurred to me that shed some light on the situation. We had just returned from a week away staying with my mother in Brisbane. I was working for the week so my husband looked after the children with the help of their Granny. There were many meetings and greetings, unfamiliar environments and new faces popping by. 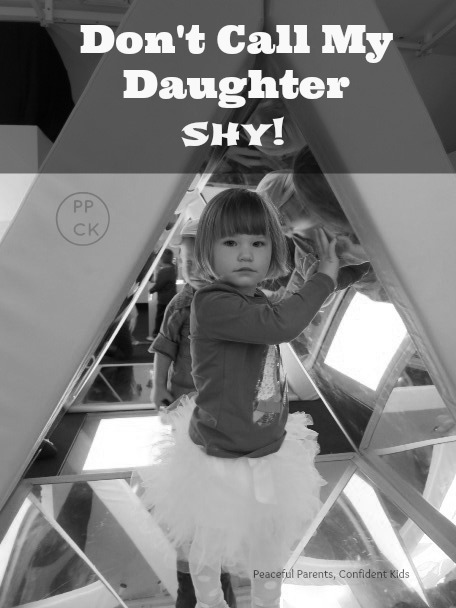 Throughout the week, my daughter would have heard that she was ‘being shy’ on several occasions by well-meaning people. Because I was not with the children for much of the week, this would not have always occurred and Lucy may have started thinking more about her shy traits and what it meant. On the morning she was to go to her new school she would have known she was heading to a new environment and would have to meet new people and she may have worried what the expectations would be of her. So I said to her: “Are you a little concerned that you will have to talk to your new teachers and won’t feel comfortable? Do you think they will think you are shy?” She replied in a little voice: “Yes!”‘ I then let her know that it was perfectly normal not to feel comfortable talking to people she didn’t know and that it was ok not to say anything until she felt happy doing so. When we arrived a few minutes later, she bounced out of the car and straight into the daycare centre. After a quick (silent) greeting she made herself right at home playing with the puzzles at the table whilst I spoke to the teacher. She happily kissed me goodbye when it was time for me to go. When I phoned several hours later they let me know she was doing really well and exploring all the toys and activities on offer. They mentioned that she had not uttered a single word yet and they seemed a little concerned about it. When I got off the phone I wondered if I had said the wrong thing telling her she didn’t have to talk to anyone but when I picked her up that afternoon the teachers told me that after her rest time she came out of herself and chatted away to the teachers, the other children, the toys and even herself when no one would listen. The director also told me that at one point she skipped past her singing ‘Old MacDonald’ at the top of her lungs. I knew then that all was fine. I had supported her nerves and anxieties and given her the confidence to get to know her environment and the people in it at her own pace before opening up. I am constantly amazed by how perceptive my children are and just how much they take in and internalise. Moments that seem like a flash in the pan to us can be pondered over and thought about often by our youngsters only to be rehashed at the unlikeliest moments. It is therefore important to keep parenting deliberate and thoughtful. This instance has confirmed for me that my daughter is her own unique individual and not someone free to label at will. I am not sure how much she truly understands about the meaning of being shy but she knows enough to know that she doesn’t wish for people to call her that. I hope I can help make this happen for her wherever possible. This entry was posted in Building Confidence, Parenting Peacefully and tagged Building a Trusting Relationship, labelling children, Respectful Parenting, Shyness in children on October 1, 2013 by peacefulparentsconfidentkids. Oh gosh,I totally do this!! I feel the need to defend my daughter’s apparent shyness but you’ve prompted me to stop. Thanks for the links! This is brilliant, Kate. I’m so pleased you twigged to what was going on for Lucy in the car and you shared the story with us: I’ve often wondered how to respond when people call a child shy. I’ve realised, too, that it’s normally well meaning or to cover embarrassment but it can be so awkward when I don’t want the label for them! Thanks for giving me some ideas! It’s my pleasure, Nat! I hope it helps fill some of those awkward moments. I would love to hear how you go!! I was just like that as a kid too, and my son is very much the same in a lot of situations, even though we think of him as a boisterous, maniacal kid most of the time at home. I realise too that most of the time people are well-meaning when they use the shy tag – THEY are trying to make excuses for our kid’s seemingly rude/unresponsive behaviour, just like we feel like doing, and/or are trying to make things less awkward. I feel annoyed that even if I say things in a better way, like the examples you gave, I still often feel like I’m making excuses rather than just explaining. “Cat got your tongue?” really irks me though – it seems very disrespectful, and I’m not sure how to respond! Yeah, its a tough one Jo! I guess in the end we are making excuses as to why our children are unresponsive and hopefully they can see that we are explaining it honestly and fairly so they don’t feel that their lack of response is a problem. I hate ‘Cat got you tongue too? !’ What a horrible thought to put into a toddler’s head. My toddler always reaches into her mouth to check her tongue is still there when she hears that one! Awesome post, Kate, thanks for sharing! My son and I are the same, and I also loved Janet’s (and her husband’s) posts on this subject. Have you ever heard of high sensitivity? Elaine Aron writes about this for children and adults and has really changed my perceptive of what “shy” really is/can be. Oh, and I’m really glad Lucy likes her new school! Thanks Kirstie. Aren’t Janet’s post fantastic? I haven’t heard of high sensitivity. I will have to look Elaine Aron up. It sounds really interesting! Lucy is really enjoying her new school. So glad we have been able to find one that suits her and where they seem really supportive of her emotional needs as well!! Oops. Didn’t see other posts already directing you to Elaine Aron, but I concur! I get really frustrated when people label my Miss 4. I can see her internalising it and it forming part of her identity. There are done great suggestions here. Thank you. Thank you for making me as an adult feel better. Your story is almost exactly like mine growing up. My husband just called from an event and someone had said “I don’t think I ever met your wife.” Another “friend” of mine replied “Oh, you know her, she’s quiet and shy.” I am 50 years old and was so offended. She said it right in front of my husband who replied “Oh, well you don’t know here then.” Then he said maybe that is why I have trouble making friends. I thought I grew out of this stage in college when the h.s. bullies were no longer around and I felt like I was set free and my personality was shining. After many bumps in the road of life I have gone through “shyness” (hate the word) due to self esteem issues. It ebbs and flows depending upon my mood I suppose, but for the most part, I haven’t seen myself as shy, just reserved and once I get to know someone, I am fine. Thank you for making me feel better tonight. As a mom of two who are now teens, I made an effort to never refer to them with that word. I encouraged them in a gentle way to shine in their own way and that it was okay to feel certain ways with different/new people and it’s just a part of life. Thank you again for an awesome reflection and suggestions to parents. Hi Sally, Thank you for popping by to tell your story. You and I sound very similar as I too go through patches of shyness (I also hate the word!) depending on my mood. It sounds like you have done a wonderful job with your children, supporting them to be whoever they choose to be.